The Debut Run of 1000 first-print copies is the perfect option for a first-time author looking to get a foot into the door of the competitive Australian children's literature market and present their imaginative creations to the world for the first ever time. 1000 copies is the "sweet spot" Little Steps has found for aspiring authors over almost 10 years of experience in publishing. The Debut Run is the minimum required to properly test your book out on the market, at both traditional bookstores and online. You'll get a good deal on printing costs, allowing for better margins upon sale, but you won't take too much on board too quickly if costs are a concern for you. The Recommended Run of 2000 first-print copies is ideal for those who are confident that young Aussie readers are busting to read their books. This package is perfect for established authors with a captive audience, looking to salvage their copyright from traditional publishers, keep a larger share of royalties and build their fanbase. With higher returns promised on cheaper printing costs, the option is also the obvious choice for an author with known demand for their book, looking to get a sizeable stock out to eager readers. Or if you just wish to take a punt on your book and save money on reprints, the Recommended Run will ensure greater exposure and presence in the market, bolstering your chances of getting sales and fans for the titles that lay ahead of you! Little Steps can also be your partner in publishing a broad range of longer-form work, whether young adult novels and illustrated chapter books, memoirs and non-fiction, to feature your fantastical realms and futuristic exploits, or your specialised knowledge. This is an option for those who only want a private collection of copies of their book, and is perfect for gifts, family heirlooms and to inspect the final printed form before ordering a larger run. Illustrated children’s e-books account for the smallest slice of the market, but they are on the rise and are an ideal option for those with a smaller budget. Children’s picture book: Apple iBook and Google Play Book. Chapter book: ePUB format for Amazon Kindle, Sony Reader, Barnes & Noble nook or Apple iPad and iPhone. Package includes editing, digital design and ebook distribution to promote and sell your ebook. This is an exciting option for those who wish to experiment with the growing wonders of multimedia apps, to feature additional audio, visual and interactive components to their narrative. Have a book idea that doesn't fit the package? We can do everything from board books to pop ups, and have finishes that range from glow in the dark to scratch-n-sniff. So for advice or pricing on how to make your book POP, just get in touch! 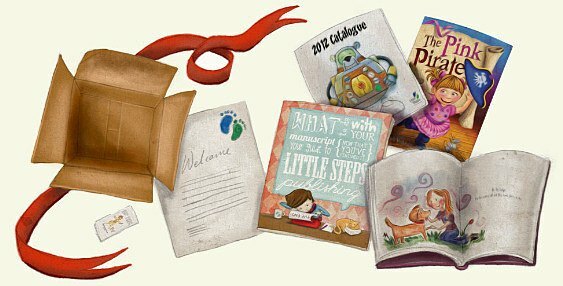 Includes a guide to partnership-publishing, writing tips, frequently asked questions, package details, testimonials, an introduction to the Little Steps team and a Little Steps Publishing catalogue.